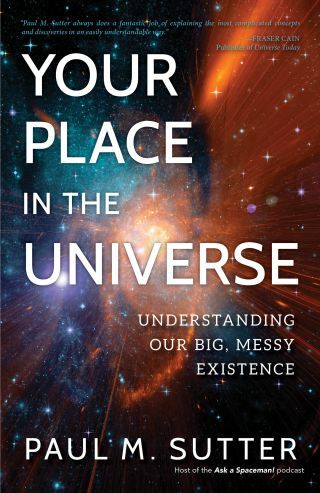 Astrophysicist Paul Sutter's "Your Place in the Universe: Understanding Our Big, Messy Existence" was published Nov. 20, 2018, by Prometheus Books. Have you ever wondered about your place in the universe? I know I have, and so has astrophysicist Paul Sutter, whose new book "Your Place in the Universe" aims to bring the nearly 14-billion-year history of the cosmos down to Earth. And now, you have a chance to win a copy from Space.com! Today (Nov. 30), Space.com will interview Sutter in a Facebook Live event at 4 p.m. EST (2100 GMT) and we'll be giving three autographed copies of Sutter's book away during the event. All you have to do is tune in on Facebook and ask a question in the comments section. We'll select three winners at random and contact them after the event. Sutter's "Your Place in the Universe" is one of the most accessible space books I've ever read (Disclaimer: I did review a preview copy) so do tune in to learn the story behind it and get your questions answered! If you're looking for more details on the book, you can read an excerpt here and an interview with Sutter by Space.com's Mike Wall here. You can also find Sutter online at his Ask a Spaceman podcast, where he regularly posts videos explaining key space concepts. Or watch Sutter's "Ask a Spaceman" presented by Space.com on Facebook Watch!